Grimes Golden is of historical interest as the probable parent of Golden Delicious, and is usually considered to have a richer flavor than its offspring. Spicy sweetness is perhaps the best way to describe it. It is green/yellow in color, changing to yellow in storage. The apples store well and have a high sugar content. We might have more in stock later in the season or next season. Click here to go on our waiting list. Fill in the details below and we will let you know when Grimes Golden apple trees are back in stock. Grimes Golden has a narrower climate range than Golden Delicious, being traditionally an apple for the central and eastern states, zones 5 and 6, and not especially winter hardy. Grimes Golden is generally productive but not necessarily a regular bearer, which was one of the main reasons it was replaced by Golden Delicious as a commercial apple - however the home grower is likely to put up with Grimes Golden's uncertain productivity as a trade-off for its richer flavor. In a good spring the fruitlets may require thinning. Fruit size is generally larger in the higher zones. 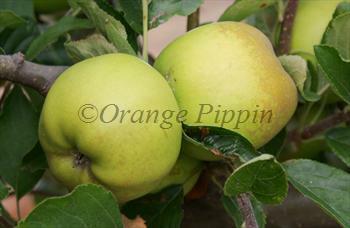 It is self-fertile and (like Golden Delicious) a good pollinator for other apple varieties. West Virginia, early 19th century.